Home/Our Story/What is with the spelling of Adirondak Loj? What is with the spelling of Adirondak Loj? I came to the Adirondak Loj for the first time with a group of friends when I was in high school. The Loj was too expensive for a couple of high schoolers who watered plants in a greenhouse and bagged groceries for a living twenty hours a week, but we did manage to splurge on a campsite at ADK’s Wilderness Campground. I drew the short straw during the planning process, becoming responsible for calling the Adirondak Loj to make a reservation. This wasn’t a pleasant task for an introverted, low confidence high school student like myself! Why don’t they have online reservations? Before I made the reservation I remember thinking, “How in the world do I say Adirondak Loj?” This is a very unusual spelling. The “Adirondak” part is easy-it must be a simple spelling error where someone forgot the “c”. The truly challenging part was the word “Loj”. How in the world was I supposed to say that? “Lowgsh”? “Loggia”? “Lodge (but spelled strangely)”, or is it spelled out, as in “L, O, J”? I believe I decided that if I had to say the word at all during the phone conversation, I would simply spell it out “L, O, J” and hope that the staff would figure it out. It wasn’t until I got to the campground and heard ADK employees saying Adirondak Loj that I realized that there isn’t a special pronunciation; it’s just a wacky spelling for Adirondack Lodge. I think many of us have gone through this confusion at some point during stays at the Loj, or at the start of a High Peaks adventure. So, where does this unusual spelling come from? As it turns out, there actually is a reason for the spelling; it isn’t some strange Adirondack thing to be unique. To discover the origin of this spelling, we need to go back in time a little over a hundred years to a man named Melvil Dewey. In 1895, Dewey moved to the Adirondacks seeking relief from hay fever and founded The Lake Placid Club. Prior to this, he had spent years as a librarian at Columbia University, the secretary of the Regents of the University of the State of New York and the New York State Librarian. Dewey’s most famous contribution was his creation of the Dewey Decimal Classification System that is still used in many libraries today. He bought the Adirondack Lodge in 1900 as a branch of the Lake Placid Club from Henry Van Hoevenberg, the builder and proprietor of the original Adirondack Lodge. Melvil Dewey had a passion for simplified, phonetic spelling. Under his direction, the spelling of Adirondack Lodge was changed to Adirondak Loj. Heart Lake was even changed to “Hart Lake” and the menu for breakfast might include “cofi” as a popular hot beverage. The Lake Placid Club abandoned the simplified spelling by the 1950’s but Adirondak Loj stuck and wasn’t changed when the Adirondack Mountain Club bought the property in 1959. 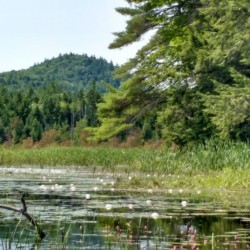 The current spelling of the Adirondak Loj is one of the last living legacies of Melvil Dewey and The Lake Placid Club’s ownership of the Heart Lake Program Center. It is certainly a cause for confusion and mispronunciation. Just to add confusion, the approach to the Adirondak Loj is down Adirondack Loj road (with a “c”). Although I have worked for the Adirondack Mountain Club for five years, I still sometimes misspell Adirondak Loj. 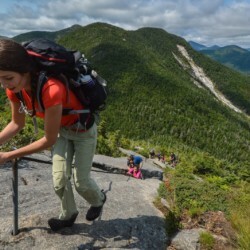 It is an unusual name for a unique place in the Adirondacks: a hub of activity, adventure and discovery.